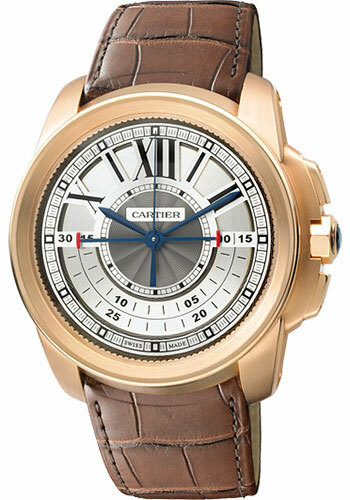 45mm 18K pink gold case, sapphire back, guilloché galvanic slate-colored dial with black transferred Roman numerals, manual winding caliber 9907 MC movement with chronograph function, approximately 50 hours of power reserve, alligator strap with 18K pink gold double adjustable deployant buckle. Water resistant to 30 meters. 42 mm by 12.6 mm thick 18K pink gold case, heptagonal crown set with a sapphire, 18K pink gold bezel with rail track, sapphire crystal, silver dial with partly snailed opaline, pink gold finish chamfers and luminescent sword shaped black oxidized steel hands, caliber 1904-CH MC automatic movement with chronograph and calendar aperture at 6 o'clock, brown alligator strap, 18K pink gold ardillon buckle double deployant. Water resistant to 100 meters. 42 mm by 12.6 mm thick 18K pink gold case, heptagonal crown set with a sapphire, 18K pink gold bezel with rail track, sapphire crystal, silver dial with partly snailed opaline, pink gold finish chamfers and luminescent sword shaped black oxidized steel hands, caliber 1904-CH MC automatic movement with chronograph and calendar aperture at 6 o'clock, 18K pink gold bracelet, 18K pink gold buckle safety clasp. Water resistant to 30 meters.